We're a long established florist delivering throughout NE Surrey and SW London.We are proud of our great reputation for quality, value and attention to detail. Every order is important to us, every gift of flowers, every funeral tribute, every bride's bouquet . Every item is unique and will be created especially by our team. We don't believe in copies or second rate We want you to have the best. 'Surbiton's favourite florist' as described by journalist June Sampson. 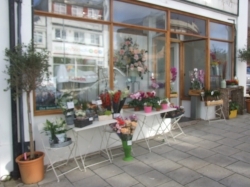 Elsa Brown Flowerstyle has been trading in Surbiton for 50 years.They have gained medals and awards for floristry from The Chelsea flower show, Interflora and a variety of professional bodies. Society of floristry accredited and members of the British Flower Industry Association.their expertise is second to none. They always support British growers first before adding to their extensive range with flowers from around the world. Arrangements for companies and individuals for special occasions or on a regular contract. We can deliver funeral tributes to all funeral directors in the surrounding area including; Paines, Garners, Alan Greenwood, Co-operative funeral care, Trueloves, Longhursts..
Surbiton is part of the Royal Borough of Kingston upon thames. We deliver regularly throughout the borough and surrounding areas of Richmond, Esher, Epsom,Wimbledon, Worcester Park. With 24 hrs notice we can also deliver to Sutton, Leatherhead, Ashtead, Twickenham,Hampton and into south London. Excellent service, as usual. We recommend Elsa Brown Flower Style completely for efficiency and absolute attention to any detailed request. Politeness and respect to customers is shown unfailingly. We have used this shop several times and always found perfect satisfaction. Flowers were really lovely better then l had expected. Will definitely recommend. Everything done perfectly no problems will use again. Many thanks for a very professional service. We asked for a slightly informal, naturalistic arrangement for our father's funeral and it was perfect, just what we wanted. Great flowers, great service. It is always my favourite florists. Such a friendly place and so helpful. Very friendly very helpful florist,. Able to deliver to the local area on the same day, with a beautiful high quality selection of flowers. Would gladly recommend. Beautiful display of lovely spring flowers. Would definitely recommend this florist. Elsa Brown were absolutely fantastic - they took my request at very short notice for my grandfathers funeral and the flowers they provided were just perfect - I?? ?d asked for something small and subtle and the arrangement was just as I had imagined, if not better. I thought they were also a very reasonable price for what was provided. It was a lovely tribute to him. Thank you very much! The flowers were delivered on time and the service was excellent on the telephone and the flowers much appreciated. Many thanks. Dependable and quality florists. Very helpful staff who provide excellent advice in a friendly manner, providing the best flowers available for the season. We were more than satisfied. You did an amazing job. We found the whole experience from coming in to discuss our request and listening to your knowledgeable suggestions, to seeing the final arrangement, all very enjoyable and uplifting.The flowers for Mum's coffin were perfect ,incorporating everything we'd asked for and more- white tulips, lilies, roses, agapanthus and more. Utterly stunning. A huge thank you. On behalf of my Nephew and myself,I cannot rate Elsa Brown flowers (Sheila)enough she went above and beyond the service we both received from her given that it was between Christmas/New year,very professional caring attention given to us also out of area have previously had flowers delivered to myself and used Sheila before, would definitely recommend her .????????????. we use Elsa Brown Flower Style on a regular basis and we only have the highest praise for their professionalism, such beautiful flowers, help and expertise. Thank you Elsa Brown Flower Style! The staff were exceedingly friendly and helpful and the flowers were delivered promptly. I was also surprised and delighted when they sent me a picture of the bouquet. A very nice personal touch. Full marks. Beautiful flower arrangement, value for money and excellent service. I would definitely recommend to all my friends. Wonderful customer service. I am abroad in the U.S. and the wonderful Elsa Brown did a lovely arrangement which was personally delivered on my Mother?? ?s Birthday and was greatly appreciated. We must do more to support these wonderful small businesses which offer such great personal service and attention to detail. Thank you! Absolutely amazing... Thank you so very much.. Just what I wanted... You made the thistles work.... Thank you so v v much. Beautiful flowers!!! Same day delivery as well! Excellent service and fantastic flower display exactly what we asked for in terms of colour etc Highly recommended. Funeral flowers were beautiful - actually way above expectations. Autumnal colours were exactly as requested. Prompt telephone answering. Extremely friendly service. Very very reasonably priced. From my experience, I would definitely recommend this florist. Excellent service as always. Great display. Great team. Very good service. My Aunt thought the florwers were lovely. Thank you. Excellent service. Shiela did the work very professionally and delivered flowers to Goodie Kalsi on time. Daman Pal Singh, New Delhi. Excellent service, and beautuful flowers! Wonderful lady with magic green fingers. Thank you for such a wonderful arrangement. Mum would have loved them. The flowers were fantastic and exactly what I wanted. The overall service and courtesy were of a very high standard. I will definitely will used the service again and recommend them to my friends. Neville. What a fantastic service, Within an hour, Sheila took my order, payment and delivered the flowers! Thank you! The choice of arrangements was amazing, and the cost far better than other florists. Thanks! The flowers were beautiful and she loved them! First class service - beautiful flowers, delighted recipients, professional service, everything confirmed by email - including the message, delivered exactly as agreed. Thank you! Beautiful shades of pink fresh flowers very pleased with Elsa Browns Florist. Excellent as always! Thank you. I was very particular as to the flowers I wanted for my father?? ?s funeral. Sheila advised me on what would work and colours and carried out my instructions perfectly. The flowers were utterly exquisite and without a doubt, gave the family great comfort.. I placed an order late afternoon, not only did this exceptional Florist deliver a beautiful Azalea for me she also sent me a photo showing same. My friend who received the Azalea was absolutely delighted and 3 weeks later she has rung to say how abundantly beautiful the plant is. Thank you so much for your help in making two people extremely happy and I will certainly recommend Elsa Brown unreservedly. very Helpful and everything was as I wanted. Flowers were just as I described to the very helpful florist on the phone . Very pleased with everything would highly recommend . Sheila was an absolute pleasure to deal with. I ordered over the phone & the flowers were delivered on time & look amazing. I would definitely recommend Elsa Brown flowers- brilliant florist!! Fantastic service again. I asked for a hand-tied bouquet based around one type of flower (white freesias) and left the rest up to them. The bouquet is beautiful - a great mix of flowers with a lovely colour palette. Excellent telephone order. Friendly and helpful service. Very lovely 'Posy' of flowers. The recipient advised the flowers were lovely but I have not seen a photo so cannot compare to the website photo. Ordering was easy and the flowers delivered were beautiful. I ordered these beautiful flowers for my mother-in-laws funeral. Sheila was incredibly helpful and guided me through what was appropriate for a natural burial. Highly recommended. The flowers were absolutely beautiful, exactly what I wanted. My dear Mum would have loved them. Sheila is a lovely lady and understood and interpreted exactly what I wanted. Would highly recommend. The posies were very pretty and complimented the natural style of the main casket arrangement. Sheila spent time with us choosing and discussing the flowers that we thought we would like. I would highly recommend. I ordered the flowers by telephone because I needed them to be delivered within a short time window. Julie the assistant who delt with my order was very helpful. My wishes were met and my daughter in law was absolutely delighted with the bouquet, she said it was beautiful, I had left the selection of flowers to Julie with just a suggestion of colours. Living a great distance away from my family it is very satisfying to have such a reliable shop that I would not hesitate to use again. Thank you. The flowers are very beautiful indeed, and are delightfully and skilfully arranged. They are just what I wanted, I am very pleased with them, and they are in an attractive basket. I know the recipients will be thrilled with them. The service was very good and helpful, we had a difficult timescale for you to meet and everything possible was done by yourselves to try and help, with a good outcome for all. What a first class service I rang this morning asking for a bouquet for my cousin, I spoke to a lovely lady called Julie who couldn't have been more helpful, I have just had a photo from my cousin theyhave been delivered and are beautiful. Thank you so much, I live in Norfolk but am originally from Tolworth so I still have family in the area I have put your number in my phone for future use, my niece is getting married next year so I'm going to recommend you to her for her bouquet. Beautifully arranged flowers. Delighted with them. Very professional, personal, efficient service, with a beautiful gift of flowers . It was a first class friendly service. The wreath surpassed my expectations, and the flowers were really fresh. Fantastic service and fantastic flower! Have used before and will be using again! Thank you. Wonderful service from Elsa Brown and the team. I particularly love the fact that they send you a photograph of the actual flower arrangement they send out rather than a generic one off the website, I came in and asked them to make a delivery of a flower arrangement for a bereavement. Once delivered I received an email confirmation that is was safely delivered and a photo of the arrangement to go with it. Price was very reasonable too! An excellent arrangement of lovely fresh flowers. I thought it was very good value for money and best of all there was no delivery charge. Another florist local to where they were being delivered wanted to charge ??7.99. I would definitely use this florist again. Amazing flowers, delivered in good time, beautiful arrangement much admired by all. Can't recommend highly enough - have used this florist before and will continue to do so. First class service. Thank you so much for my parents wonderful bouquet for their Ruby Anniversary. It was exceptionally easy to order over the telephone and the customer service was fantastic with specialist advice about what was in season and would be appropriate. The bouquet was delivered two days later, on time as described. My parents absolutely loved it. Thank you very much, flowers delivered. Lovely arrangement, Ordering from SA is not easy and when I look at picture I always think that I won't get what I ordered. Your arrangement went above my expectation, thank you again. Simply stunning! Could not be happier with the flowers and the service was impeccable. Excellent service, thank you. The recipient was delighted with the flowers too!!! Flowers were well received. And easy to use online service. Thank you! Excellent service, flowers were beautiful. I would highly recommend Elsa Brown. thankyou, a prompt delivery of beautiful flowers Delighted with the service, Shiela did a great job. Thank you so much for the gorgeous flowers. Both the 'grandad' letters and the heart were gorgeous and exactly what we had hoped for. Service was great too. Thank you for making everything so easy. Very pleased with the service I received with Else Brown. Would definitely recommend. This florist is local so, although available on line, I was able to call in and place my order personally. On the day of the funeral the flowers that were delivered were perfect, exactly what we had requested, and the family made a point of thanking us for "the lovely flowers". Very reasonable price and I would not hesitate to recommend them. I would definitely use them again. Polite service and our friends were happy with the flowers. Many thanks. Order taken over the phone and then delivered on time the next day The flowers were lovely and well presented. The wreath delivered for my father's funeral was beautiful, included the flowers I'd asked for. The service was hassle free and prompt. Thank you. Staff were knowledgeable and friendly. Computer images made choice of shape and colours easy. Arrangement was as image and delivered as arranged. Overall, a very good service. Beautiful flowers arranged exactly as ordered and delivered promptly. Excellent service all round. Elsa Brown Florist gave an excellent service. The florist discussed what sort of flowers, effect, colours we wanted and made sensitive and creative suggestions. The arrangement was delivered at the right time and looked beautiful on the coffin. The scale of the rating sequence given above is not clear; however we found Elsa Brown florist excellent. The person I sent the flowers to was delighted and sent me a photo within minutes of receiving them. I was very pleased with the value for money and delivery service which Elsa Brown Flower Style provides. Highly recommend this florist. Friendly, helpful service and very accommodating to my request for same day delivery for my mum (who lives not far from the florists). Great service, thank you. I called from Australia to order flowers for my sister's birthday just before New Year's Eve. The service was polite, helpful and easy, and the flowers were delivered the same day. I got an email to show the bouquet before it was sent and then one to say it had been delivered. My sister was delighted with the flowers. Thank you. Excellent service and helpful stff, l well detailed paperwork. A first class service. I ordered the flowers late morning on 22nd December, concerned they would not arrive before Christmas, due to my late order and the busy time of year. They were delivered within hours and th recipients were overjoyed at the quality of the flowers. Thank you so much!! Stunning flowers. Thank you so much. Fantastic 5 star service. So very helpful at such a difficult time. Everything was made so easy in describing various choices available in how the flowers might look and an extremely beautiful photograph was sent to me of the floral display. I am so grateful for the excellent service and would thoroughly recommend this florist to anyone. Just wanted to say the flowers were beautiful, thank you so much,would not hesitate to recommend your florist,.The service was excellent too,could not of been more helpful,thanking you once again. Lynda Watson. Flowers were beautiful and far beyond expectation. The service from Elsa Brown was superb throughout. They advised, anticipated our needs, coordinated with other family members and did all they could to help with a distressing and stressful time. They even added 3 roses for myself and my 2 sisters to hold throughout our Mums funeral which was unexpected and wonderful. Beautiful exactly what the family wanted , thank you ???? great flowers as usual. Thankyou so muchfor your help. Flowers looked great. Thank you. We were very happy with the beautiful floral tribute the florist (Elsa Brown Flower Style) made for my mother's funeral. She took the time to understand what my mother liked and suggested a wreath of 'garden flowers'. This was beautifully executed and we are very grateful for the sympathetic service we received at this difficult time. Highly recommended. Sheila was very helpful and accommodating when discussing the order and the lady delivering the bouquet rang me directly rather than ringing the door bell to ensure that the delivery was kept a secret. The flowers themselves were beautifully arranged and Sarah (the lady retiring) was thrilled. Very good service and value for money. We would have no hesitation in using Elsa Brown again. First class service, thank you. Paddy James. Flowers were exactly what we wanted, delivered perfectly. Good, professional, friendly service. Extremely happy with professional service received. Wonderful display, exactly as we envisaged. Everyone commented on it, even the funeral director. Thank you so much. The flowers were beautiful. Else Brown dos a magnificent job. 1st class, would definitely recommend. At very short notice, this is exactly what we wanted, thank you so much. The flower choices were just perfect for both bouquets - they were just the style and colour I described over the phone. Thankyou. Thank you so much for the beautiful arrangement of flowers. Excellent customer care and help in choosing something appropriate for the occasion. I was delighted with the floral arrangements for my father's funeral and also with the professional and pleasant manner of Elsa Brown Flowerstyle. I would highly recommend them. The flowers were exactly as I had ordered. The bouquet was natural looking with a beautiful raffia tie. I am not sure I liked the heading from Direct Florist - flowers for THE LATE MARGARET CHAPLIN. Just Margaret Chaplin would have been fine. Amazing bouquet! Great service. Thank you very much. Beautiful arrangement and very friendly and helpful service. Wonderful service, as usual. Thank you! Great place with caring people . Always produce great arrangements. Easy to order by phone. Recipient delighted with bowl of Spring flowers. Appreciated confirmation of order and conformation that order had been delivered. Very pleased. The flowers were beautiful and delivered early. Thank you Sheila - I cant wait until June when you will be creating flowers for our wedding. They were exactly like the picture , beautiful and fresh, thank you ! a beautiful arrangement, colours as discussed and arranged to fit and compliment coffin. Friendly helpful staff and great service. Lovely to have photo of flowers emailed. Excellent value for money. I would certainly recommend to others. Thank you. Perfect as usual. Highly recommend. You guys are awesome! !! Prompt service. I ordered flower from Canada and surprised of how fast you have delivered the flowers same day. Great service! Excellent service, very thoughtful and helpful people. Many thanks. The bouquet was beautiful and my mother was delighted. Thankyou so much for the beautiful arrangement you done for my brother .This order was done over telephone Elsa was so helpful and had a very friendly manor.The flower arrangement was amazing excellent service .I put my trust in you Elsa and you did not disappoint thankyou so much.I would like to have given you more stars if possible full marks all round . Excellent service superb service. Thank you ????. My friend was delighted with her flowers and the prompt delivery. Great help with choice and design of requirements. Excellent flowers beautifully displayed. Service first class, as always. First class service. Beautiful creations. Very impressed and will use Elsa Brown again. Thanks very much. Very efficient and personal service-beautiful flowers and exactly what we ordered. I was away in Spain at the time of the funeral and had to order in advance of going away - you then confirmed on the day of the funeral that flowers had been sent for Ron Barwood on the day. Such an excellent service - thank you! cannot think of anything new to say - Elsa Brown service is always FIVE STAR !!!!!!!! Thanks so much for the beautiful stand up bouquet of flowers for my Aunts funeral. The colours were perfect and the bouquet arrangement was lovely. Whilst I didn't see the bouquet itself, my friend was delighted so it must have been lovely! Most beautiful flowers with carefully chosen colours arranged in a vase as a gift. Plants brilliantly wrapped as a raffle prize. A basket of fruit for a gift. All delivered and Service as always with a smile over an above any expectations. Elsa Brown Florists are caring and very friendly. A great place to go for all your flower displays, whatever the occasion. Local firm providing top class arrangements. I ordered these flowers for my Aunt's birthday. The person I spoke to Sheila was very helpful and obliging. I've received a letter from my Aunt stating how wonderful the hand tied bouquet is and the flowers are so fresh. I would certainly recommend and use Elsa again. Fantsstic in every way. Brilliant! Really beautiful and just the right colours. Thank you Sheila. Absolutely over the moon with my dad's coffin spray - exactly what I wanted. Brilliant. Princess Alice hospice will be delighted too with the flowers being donated - truly wonderful! Beautiful flowers, excellent service. Nothing was too much trouble, including ordering lily of the valley when it was out of season! I cannot praise this florist enough and I would not hesitate to use them again, my sister-in-law was delighted with this spring arrangement and thought they were beautiful. Thank you so much to Sheila and her staff, nothing was too much trouble for them. Very happy with the service. Personal and delivered on time, my friend was thrilled with the wonderful bouquet. Thank you, will certainly use Elsa Brown again. My experience with Elsa Brown was definitely "5 star"! I called from Canada, and received very warm, professional and helpful service. My flowers were delivered promptly and I especially appreciated the email with a photo. The flowers were stunning. I would definitely recommend this florist. Great service. Value for money. Very good flower arrangement and speedy delivery, also very friendly staff. Friendly and great florist . Beautiful flowers and plants with excellent service. Very helpful, friendly and efficient. Would use again. Very impressed with the cheerful and helpful service when I telephoned my order for a funeral spray. The photo of the finished flowers was much appreciated, especially as I was not able to be present at the funeral. Well done! Shelia from Elsa Brown spent time with me going through the floral design for this beautiful anchor tribute for my father's funeral. Her sensitivity and ability to listen and make strong suggestions gave me the assurance that this florist was the right choice for my dad, Michael Anthony Paddon's funeral. Order over the phone and the resulting arrangement was just what was required. An immaculate and beautiful wreath matches the fantastic service. Elsa Brown have lost none of their longstanding commitment to delivering quality bouquets and now back that up with an excellent feedback with photos of the flowers delivered. Beautiful flowers, we ordered 4 in total, each was just what we asked for and more. Very helpful, with advice and suitability. couldn't have asked for more. Will certainly use Elsa Brown again and recommend to friends. Very easy to deal with , a very understanding lady dealt with my order. The experience radiated a very professional approach. Would definitely recommen this firm. Very fast same day delivery in 2 hours from order! Great flowers. Our daughter in law was very happy with the beautiful flowers. Again it is great that you know the product you are ordering is going to be of good quality. Also pleased that a local" business was used." Beautiful flowers again, thanks! (from me and a very happy wife on her birthday). Elsa Brown has never disappointed, I'll be back! Excellent service as usual. The spring basket arrived in good condition and my aunt and cousin were delighted with it. Hilary. Beautiful flowers promptly delivered with a smile. Fantastic service. Warm, sensitive, caring support in selecting flowers over the phone for a sad situation, and same day delivery. I would definitely use again and I recommend them to others. Nice lady, lovely flower spray delivered on time. All worked well. I have always received extremely good personal service from Elsa Brown,,and the recipients of flowers have always been very pleased with the selection. Amazing service at such an emotional time. I ordered a posy for a 3 year olds funeral. Delivered as stated to the funeral home.A faultless and very caring service. Thank you so much for the beautiful flowers. Excellent service, very personal, beautiful flowers. Very beautiful flowers and a lovely florist would use them again. I just got a call from a very happy wife after delivery of these flowers. Great job, and thanks for including the flowers I asked for, perfect!! Great response from the recipient of the flowers, very happy worth the service and quality. Our friends were delighted with the flowers. Thank you. Prompt delivery, and a lovely bunch of flowers for a little girl, for a reasonable price. My gift of Mother's Day flowers were hugely appreciated, - they came on the day and were an exceptionally beautiful and creative arrangement. I have come to really trust this service as providing the best, in service and quality. Always on time with long lasting flowers. Great personal service for over 40 years! My sister enjoyed her flowers but when I saw it, I was just slightly disappointed, as the on-line picture had made it look like a circular centrepiece but its shape was more elongated. It had not seemed quite as full and cheerful, as I had anticipated but that may be because I selected the standard priced one. Nevertheless, it looked fine on her fireplace, where she placed it and the quality and promptness of delivery was still excellent. Thank you and enjoy your Christmas. Beautiful job and arrived on time. Thank you for making our daughters birthday special while away from home! our customer has just been into the shop and said the receipents were very pleased with the flowers and said they were beautiful. we will certainly use you again. Excellent arrangement, dead on time. Would definitely recommend. Would most definitly use this florist again. Flowers arrived in time and were gorgeous! Flowers were delivered timely and the bouquet was just beautiful. I would definitely use again. The arrangement was even prettier than pictured ( my sister, the recipient, sent me a photo of it. ) I will definitely use Elsa Brown for all future floral needs in Surbiton. Thank you for being so prompt and honoring the one request I made. excellent service! flowers were lovely and very similar to the image show, definately would use again. Great service and delivered quickly. My daughter loved the flowers, and from the picture she sent they looked beautiful. I will definately use this service again! thanx! Wonderful service, chose 'florists choice' of flowers and a beautiful bouquet was sent, it was exactly as I had wanted. Specified AM delivery and was there before 9.30am. My mother was very happy. I will definately use Elsa Brown FlowerStyle again. Many thanks for the great service! prompt service. thank you very much!! !